Earlier today, Capcom announced a new Mega Man game. Usually if Capcom announces a new Mega Man game, I'd do a proper post. But no, not for this game. It's not a proper Mega Man game. Instead, Capcom is releasing a Mega Man social game for iOS. Look, social games are fine. iOS games are fine, too. This could be the greatest social role-playing game iOS has ever seen. But let's face it, I do not want a social Mega Man role-playing game. You probably do not want a Mega Man social role-playing game. Nobody in his or her right mind wants a social Mega Man role-playing game. Capcom is throwing us scraps, breadcrumbs. 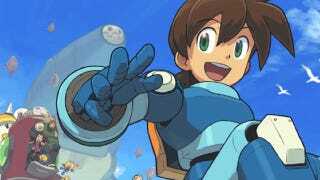 After the disaster that was Mega Man X for iOS and after canning Mega Man Legends 3 (and Mega Man Universe, too), Capcom seems to be scrambling. It's got the Mega Man brand, so why not make a social game? Rome wasn't built in a day, and for all I know, Capcom could be working on proper Mega Man game—and could be announcing that shortly. I do know that former Mega Man producer Keiji Inafune offered to finish Mega Man Legends 3 for Capcom, but the company killed the project instead. I also know that social games don't cost a lot of money to make, but can turn huge profits. But c'mon, it's Mega Man's 25th anniversary. If you've run out of ideas, Capcom, hire this kid. Fans deserve more. Mega Man does, too.